When the indicator paused and I came tight on a fish, it was unlike any feeling I’ve had chasing fish with a fly rod in a freshwater river. These fish surprised me with the raw power they had when they made the reel sing and knocked your knuckles on blistering run after run. When a fish was first hooked the violent surface eruptions and head shaking was heart stopping. The thought “fish!” hits you when the line comes tight then a combination fear, uncertainty and quick reaction take over. The speed and strength of the fish in the river made everything happen so quickly. The realization overcomes you that this fish is in total control and you are merely along for the ride. If all goes well you find yourself minutes later a hundred feet down river trying to turn the head of a fish that just won’t give up. Many fish feign that they are tired only to go on blistering runs over and over at the net. A ratio of one fish landed for every three hooked was normal. I hooked up and landed three fish in a row only to have the next two grab the fly, then throw the hook and rocket out of the water before the indicator twitched. This entry was posted in fishing report, video on November 25, 2007 by Jason du Pont. 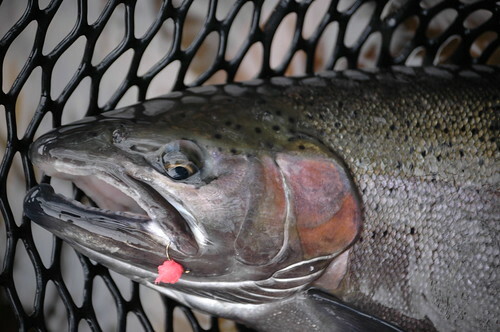 For some unknown reason Steelhead fishing managed to stay off my fishing To Do List, until recently. I loaded the Mariner Hybrid with my heavier Scott rods, a big net, vise, 2x heavy scud hooks and tons of egg yarn. Patagonia Capilene layers were essential to cold weather fishing along with heavy socks and micro puff clothing. Matt Devlin and I made the seven hour drive to Altmar, New York on twelve gallons of gas on Sunday November 10th. We arrived that afternoon to find 60-80 people lined elbow to elbow in the first 100 yards of river below the town bridge. I am not exaggerating, we could barely find a place to park! To say the conditions are crowded on the Salmon River is an understatement. Using my Scott E2 ten foot six weight, I had people so close below me that I could barely swing my line with little more than the leader on the water. The Douglaston Salmon Run cost $30.00 for a day pass, and was worth the money to get some space, although we only spent half a day there out of four days fishing. Depending on your luck the fishing could be fun or frustrating and may not be for everyone. If you enjoy solitude, or are easily rattled by anglers fishing above and below, stay at home. The fly fishing stretch had fewer people not crowding as close, with some even offering to net fish. In some situations the indicator darted upriver, and the line ripped through the water with an unforgettable sound. On our final morning a heavy lake effect snowfall began and the action got hotter as the conditions got colder. We had established ourselves the day before in a tough to wade area, and had it all to ourselves at 5:45 a.m. with some familiar faces on the far side of the river back for more action. It wasn’t long before people were yelling, “fish on” and you struggled to clear your line of a ten pound plus steelhead leaping and splashing down river like a dog swimming after a stick. The fish created a big white wake at the surface and loud splashing would snap you out of the trance of dead drifting for hours. At times as many as four fish were on the line at once in our area. Twice I hooked up and had to wait until the angler below me swung his fish into the net, so I could do the same. It was surreal to be in a snow storm around fifty other anglers on an eighth mile of river who are all willing to brave the cold, crammed conditions for these fish. At times my hands were so cold they felt painfully hot, yet digging a heavy steelhead out of the net for a photo was an exciting moment. This entry was posted in fishing report on November 25, 2007 by Jason du Pont. The low water, at 24 CFs, has changed the fishing on the Gunpowder River compared to the higher flows we’ve seen the past three months. Gone are the days of big indicators, three spilt shot rigs and waist high water that threatens to knock you down. The soft edges that held trout weeks ago are now bone dry, but trout are still taking flies eagerly. Let’s face it, we dodged the low water bullet all summer while most rivers in the region suffered. Dry flies are a great option as they land softer than bead heads and won’t hang up in shallow riffles. Many good sized pools and runs now hold a lot of fish that have left areas that are now too shallow to hold fish. Caddis, olives and midges are good ideas for searching patterns. Anglers need to stay out of the water and stay low! The low water levels mean that anglers are now much more visible in the fish’s sight window. Avoid peering over high banks into pools below, and wading downstream. Walk downstream on trails away from river’s edge, not down the exposed gravel below the high water mark. Target the better pools, approach from well below and stay low. Kneeling or crouching may help in some areas but usually is not required in most places. Longer casts can help avoid spooking trout, but a lot of false casting over fish will put them down. Leaders 10-14 feet ending in 7X are a great idea right now. Prospect with dries while stalking upriver, and keep an eye out for trout holding on the bottom. Using 7X on nymphs is also a good idea where sight fishing is possible. A standard two beaded nymph rig needs little additional weight to reach pools 3-4 feet deep, if you cast well above the fish. Fish streamers in the best looking areas around deep water, structure or large rocks. On a recent outing one small brown was nearly taken off my hook by not one, but two 17 inch browns that appeared from a big log jam competing for the eight inch brown writhing on my hook. A followup streamer cast a few hours later drew the two big browns out of hiding and nearly to my feet, but neither would commit. Streamers may be the best option for bigger fish, but lower water in some stretches makes for unproductive streamer fishing. The flows are not expected to change for the next few months, so the fish will adapt to the change and so should anglers. The leaves are turning vivid reds and yellows, and these low flows are stranding many of leaves along the exposed shoreline. The leaves have yet to end up in the river in such number that fishing is tough. At least not yet. This entry was posted in fishing report on November 15, 2007 by Jason du Pont. The river is flowing at 24 Cfs and is cooling a bit at 52 F. Leaves are making fishing dries challenging but the fish are looking up and blue winged olives in the #18-20 range are a good bet . Long leaders in the 10-12 ft range ending in 6x are necessary to deliver small flies at a distance that won’t spook fish. Riffles and flats are holding fish, particuarly near log jams and deadfalls from Falls Rd through Masemore RD.Small prince nymphs, pheasant tails and brassies should account for fish feeding in the “skinny water.” Many anglers in the past week have been reporting steady midge activity above Falls RD.Thanks to Jeff for this great question on midges. Hey, I stopped into the shop this past weekend and picked up a leader and a few flies. I just wanted to thank you guys for suggesting that I use a zebra midge. I landed a ton of fish on them until I lost them all. Great question Jeff, typically Zebra midges imitate midges and midge larvae.The silver wire helps to “define” the fly and mimics the segmentationcommonly present with these small larvae. The ribbing also makes these patterns stand out. A lot of these patterns are very effective from Falls RD. to the dam, especially in the Winter months when more midges are present along the Gunpowder River. This entry was posted in fishing report on November 9, 2007 by Theaux Le Gardeur. November through December are exciting times to fly fish for trout in Maryland. The possibility of catching a really big trout is very good on the North Branch of the Potomac tailwater fishery. This Fall the rainbows made up the bulk of what was being caught by many anglers. Small midge pupaes were producing fat, chunky rainbows up to four pounds. These fish looked good, fought hard and some appeared to be second year or older stockies. 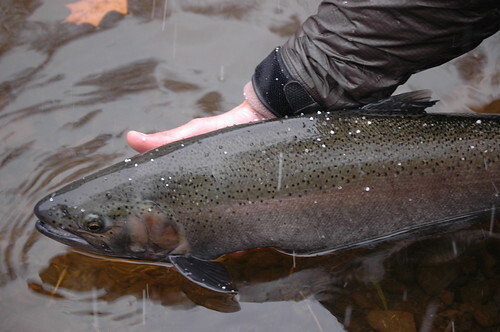 A few of the shorter, “fatties” were freshly stocked but fought hard in the river’s flows. The extremely low flows made accessing the river very easy, but may have forced the bigger browns into deeper water or made them very skittish. Warmer days and a slow Fall transition may cause spawning rituals to unfold later than normal. This video short shows some trout that were caught on small midge patterns nymphed behind rapids during mid October. Want to go on a guided trip next Fall? Mark some dates on your calendar and check out our Guide Trip Gift Certificates on our secure site. This entry was posted in fishing report, video on November 8, 2007 by Jason du Pont. Please join us for an Intermediate Fly Tying Class on Saturday, November 10 from 11:00 AM till 2:00PM. It’s a fly tying class that focuses on Snow Shoe Rabbit as a key material in fly patterns. Jason du Pont will be teaching this fun-filled intermediate class. Cost of the class is $45 per person, and includes the use of tools and materials. The class is limited to six and pre-registration is required. Please give us a call at 410-329-6821 or drop us a line at info@backwaterangler.com to pre-register. This entry was posted in events on November 5, 2007 by Theaux Le Gardeur. Revising and reworking flies, even the classics, can be an easy way to tie patterns you already know. Many tying companies offer new materials that add flash, weight and movement to create new versions of old designs. Hareline’s selection and innovative products offer something for all anglers and the Backwater Angler fly has recently expanded our tying room selection to offer more tying materials for Mid-Atlantic fly anglers. Looking for soft hackles capes, wires and tinsels? We currently have plenty of genetic hen, english grouse, starling, hungarian partridge and over 26 different colors and sizes of wire and tinsel. 17/0 and 14/0 thread are new additions along with kevlar and heavy duty threads for spinning hair. Chenille isn’t just for green weenies and worms anymore. We have over 30 colors from micro through standard sizes and three styles. Midge Cactus chenille is an estaz style chenille scaled down to the thickness of a single strand of peacock herl, and can replace herl to create new styles of old patterns. The Micro Polar Chenille and standard Polar Chenille are great for larger streamers and nymphs. Individual dubbing packs are available in over 30 colors and 5 styles including Hare-tron, Scud, Ice, Quick Descent and standard rabbit dubbing. Large selections of marabou, arctic fox and feathers are available for streamer patterns. Zonkers have accounted for numerous fish over twenty inches on the Gunpowder and rabbit strips, some barred, are in stock in every shade. Looking to scale down a Zonker to a smaller size for casting on bamboo and lighter weight rods? 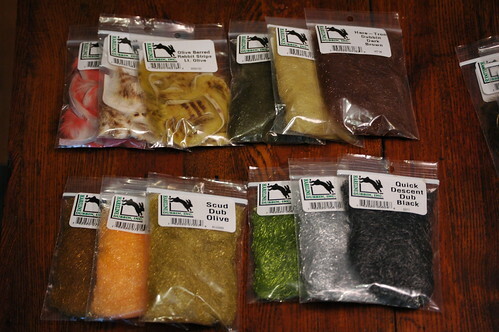 In stock are squirrel strips, which allow tying of zonkers down to a size 16. Many of the tying classes will focus on using some of these materials to create new patterns or tweek an old design. 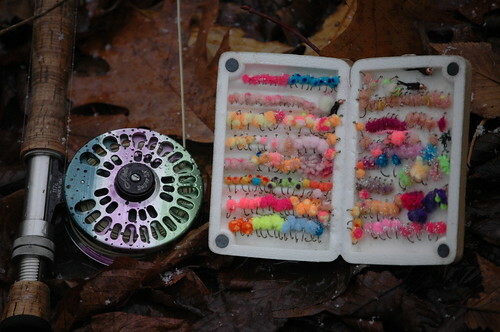 We select new and unique materials to provide tyers with quality products and the local knowledge to create great flies. This entry was posted in gear, reviews on November 3, 2007 by Jason du Pont. Each Fall Backwater Angler staff demos new products for the upcoming season. A pair of size ten wading boots from Cloudveil are about to be put through the paces on the Gunpowder River. After a few days of fishing, I plan to hand them off to other Gunpowder Guides for more testing. We will be posting reviews by different guides in the coming weeks. 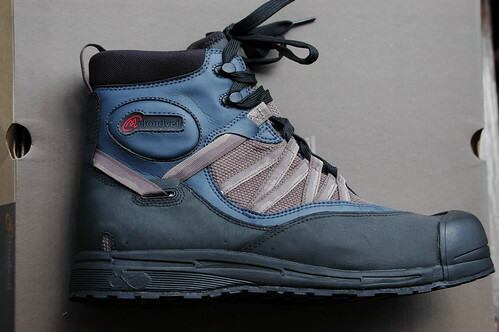 The Cloudveil 8X Stealth Wading Boot is extremely lightweight and features a 5.10 rubber sole. Soft rubbers like 5.10 are found on soles of rock climbing shoes. 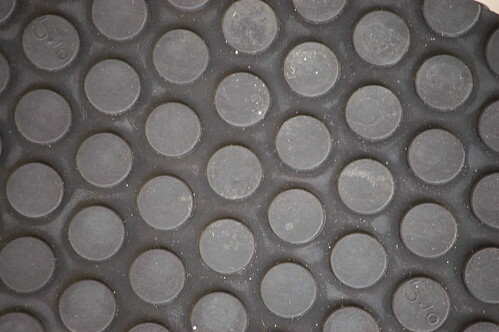 The sole smears to the rock, wet or dry, and provides constant contact by placing as much surface area on the rock’s surface. The shoe comes with inserts to allow custom sizing between a full shoe size. Rubber soles are becoming more popular and anglers are dismissing the myth that rubber soles can’t compare to felt. I’ve been in a pair of Patagonia sticky rubber shoes for two years, have rock climbed for years, and guide on Maryland’s three premier tailwater fisheries. Rubber soles are great where rocks dominate river bottoms and trails. Slick bottomed rivers like the Savage and North Branch are tough wading no matter what shoe is worn. The issue in those watersheds is high PH, which creates a fine algae on the rocks. One big thing to consider in the ever changing world and climate is that felt is becoming a vector for transporting aquatic invasives. Didymo, an invasive algae was recently discovered on the lower portions of The Battenkill River and East, West and main branches of the Delaware River. Felt has been found to contain and harbor 100% of Whirling Disease and Didymo spores when exposed to these invasives. If possible refrain from using felt on your boots. Proper drying times, 3-5 days, can prevent fishing for days, or risk spreading the diseases to other watersheds. A second pair of old wading boots designated for infected fisheries can be a great way to prevent further spreading. Rubber doesn’t absorb spores, hold water or small particles of mud. In the winter the rubber soles prevent “high heels,” which is when snow on the bank freezes to wet felt soles. Rubber soled shoes are far lighter and clean easier with a simple rinse and scrub brush. Drying time can be minimal, as the shoe has few materials that hold water.